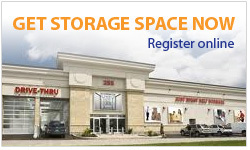 Our Ottawa storage experts can help you find the perfect storage space for your needs! At Just Right Self Storage, we offer a variety of storage unit sizes and you can always up-size or down-size your storage unit. Whether you need residential storage space, commercial storage space, or government storage space, our climate controlled storage units in downtown Ottawa can accommodate your needs. Find the Perfect Storage Space for Your Needs! View our available storage unit sizes below. If you want to calculate the approximate space you will need for your Ottawa storage, give us a call and we can help determine the exact storage space needs that you have for the goods you want to place in a secure, climate-controlled storage facility in Ottawa. You can also call us at 613-567-3333 to speak with one of our friendly storage experts. Similar to a small closet. Moving boxes, small furniture. Similar to a walk-in closet. Contents of 1 room, small amount of furniture, small bachelor apartment. Similar to a small bedroom. Contents of a 1 bedroom apartment. Similar to a large bedroom. Contents of a 2 bedroom apartment. Similar to a small one-car garage. Contents of a 3 bedroom apartment. Similar to a standard one-car garage. Contents of a 3 to 4 bedroom house. Similar to a large garage. Contents of a large 4 bedroom house.